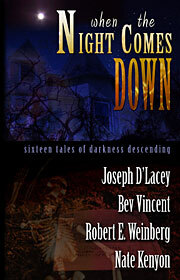 DarkArtsBooks » When The Night Comes Down – now available in ebook format! When The Night Comes Down – now available in ebook format! This anthology features some darkly beautiful fiction; download a copy to your Kindle, Nook, iPad, iPhone, etc. today! This entry was posted by John Everson on Sunday, March 18th, 2012 at 9:24 pm	and is filed under Uncategorized. You can follow any responses to this entry through the RSS 2.0 feed. Responses are currently closed, but you can trackback from your own site.